It’s that hair-raising time of the year once again, and we are not talking about Halloween. It might appear that those guys walking around looking like they just stepped out of the Louisiana swamp are from Duck Dynasty, but they are participating in the cause to bring awareness to a variety of cancers, including prostate cancer. The Movember season is now upon us for the thirteenth year, and this year the cause is focusing on decreasing prostate cancer by 25% in the next decade. The word Movember is a unique combination of the Australian-English diminutive for mustache, “Mo”, and the month we focus on cancer awareness in men November. During the month of November, men around the world are asked to participate by growing a mustache and not shaving for the entire month to help bring awareness to the cause. The idea here is that if a man shows up to work with some stubble and then a full mustache, others will inquire if he has lost his home or his ability to shave. Which means he can open the door to the conversation by bringing in, even more, people to the fold who are not yet aware of the dangers these cancers are having on men around the world. Thirteen years after Movember was first launched to raise money as well as awareness of men’s health issues. You can see signs up and down the streets, in offices, schools, and bars that this month is poised to reach an even bigger audience. In an alarming statistic that speaks to the importance of this cause, in 2015 alone, a man died every minute due to preventable types of cancers. The Movember cause is more than just a month of no shaving, celebrations in Germany, UK, Hong Kong, and the United States are held this month to bring together Mo Bros and Mo Sistas that support the cause and want to bring global recognition to the dangers of prostate cancer. The aim of Movember is for ordinary men to grow a mustache to help raise money for charities that are currently fighting prostate cancer, testicular cancer, and mental health issues like depression. Back in 2003, a group of friends decided they wanted to bring back an old trend of growing a mustache to help raise awareness of different men’s health issues. What started with a small group of guys in Melbourne Australia has exploded into a worldwide phenomenon with over 5 million people expected to attend various events around the world this year. During that first year, these friends decided that by growing out their facial hair this month, they would get cross-eyed glances and inquires as to why they stopped shaving their faces. As each friend would tell one person, that person would participate and tell another, and the challenge was on. Each guy dared the next to put down their razors, and enjoy the way a man’s face is supposed to feel for 30 days. The idea spread like wildfire, and guys everywhere look forward to explaining to friends and coworkers why they are allowing their facial hair to grow. What Are the Rules to Movember? The Movember movement has come a long since its inception in Australia in 2003, and today you can join the millions who are putting down their razors and bringing awareness to this men’s health issues. To get started, head over to us.movember.com and register, this way everyone can be counted and the word can spread even further. Start this month with a clean-shaven face, and promise to not touch your razor again until the last day of November. This means you can not groom your facial hair for 30 straight days. When you groom that mustache, you tend to blend in with the pack and no one is going to think otherwise. When you head to work in a nice suit and your mustache is a mess and is all over the place, people are going to look and wonder. This is the perfect opportunity to spark up a conversation, like “In case you were wondering why I look like a mess”, the reason is, and go into detail about Movember. This is how more awareness and lives are eventually saved. The biggest benefit to November is, of course, more men are being exposed to the information they need to get themselves checked out early enough, so these guys stop dying too young. When it comes to fighting cancer, early detection is everything, but sadly many men simply will not see a doctor and cancer spreads too quickly to be treated by the time they finally realize there is an issue. As men age, they simply attribute the need to frequently urinate each night to old age, when in fact, it could be an early warning sign of prostate cancer being ignored. Awareness of men’s health issue can cut the loss of life by 25% in the next decade. If you need more down to home benefits, imagine not having to shave for 30 days. Less time in the bathroom, more time watching football, and more time talking to the ladies. Even shy guys will have zero issues sparking up that conversation with a hot babe when he has all that facial hair calling her wild side. What is the Difference between Movember and No Shave November? While both Movember and No Shave November are geared to bringing awareness to men’s health issues, they both have their set of unique rules. While you can not shave at all during November for one, the mustache is the focal point for the other. So you have a better understanding as to which rules apply to which cause, the following lists will clearly explain what are the rules when it pertains to Movember and No Shave November. 1. Head over to us.movember.com and register that you are going to participate in the cause. There is a ton of useful information on the website you can use to spark up the conversation. 2. Begin November with a clean-shaved face or a blank pallet so to speak. 3. During the entire month of November, your only job is to try and grow and maintain an awesome looking mustache. 4. 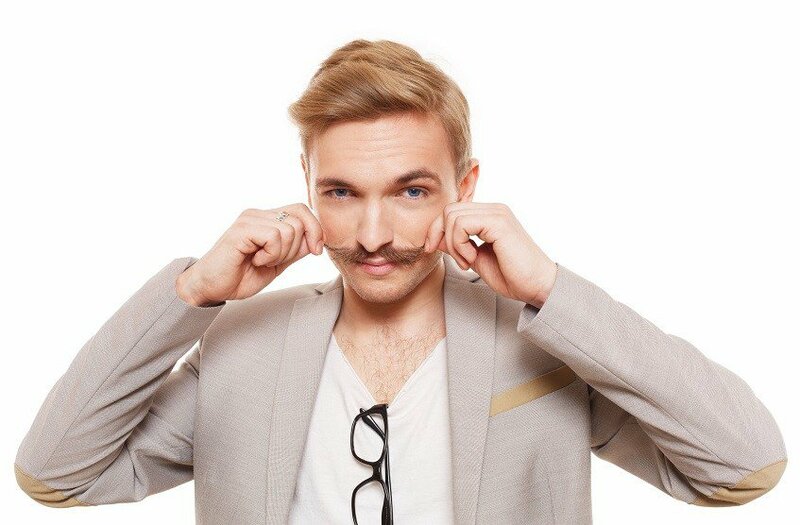 The mustache needs to be clearly defined; it can not connect with sideburns or any other areas. 5. No exceptions to the rules, beard are not allowed for Movember! That is a completely different cause. 6. No joining of the mustache under the chin like long handlebar mustaches, the lines must be clearly defined. 7. Most important: Remain a complete gentleman all 30 days of Movember. Hairy guys are not to be confused with animals. 1. Let all your facial hair grow, that means no shaving, trimming, grooming the mustache or beard for 30 days. 2. The idea here is cancer patients lose their hair during treatment, so growing hair wild brings attention to their challenges. 3. If you get people wanting to help the cause, direct them to the No Shave November website. 4. The amount of money donated should be equal to or more that the cost of shaving products that were not needed to shave this month. 5. Money saved that was usually spent on shaving supplies to be donated to the American Cancer Society. 6. Make an effort to speak to anyone about your facial hair to raise even more awareness. 7. Try to convince another male to take part in the challenge to get more eyes on these issues. While the rules for both are not strictly enforced, this is more of a fun way to get guys to realize they can live longer and healthier lives by addressing issues that are killing people each day around the world. Each time another guy is introduced to the cause, more money can be raised that will help with cancer research, and another life can be spared. Bringing awareness to cancer-related issues by growing out the hair is symbolic is something the cancer patient loses while undergoing treatment. This growing long and wild mentality is not meant in any way to take away from the strict dress codes that might be in place in many work environments. According to information on both Movember and No Shave November websites, rules are not imposed to disrupt the work environment. The Movember Foundation has been in existence thirteen years and is exposed to a bigger audience year after year due in part to the successes at the Movember events around the world. The bottom line is the organization raises awareness to cancer issues in men and then donates any of the contributions made during these events to programs and projects related to testicular cancer, prostate cancer, and men’s mental health issues. As the conversation begins to grow, members for these great causes hope they can utilize the power of the mustache to spark up conversations and support those groups dedicated to finding an ultimate cure for these diseases. Photos from: milkos © 123RF.com and Matt Takhar © Flickr.